Spin fishing around the shoreline of Lake Heron. In the back ground Mt Sugarloaf is shrouded by low cloud. 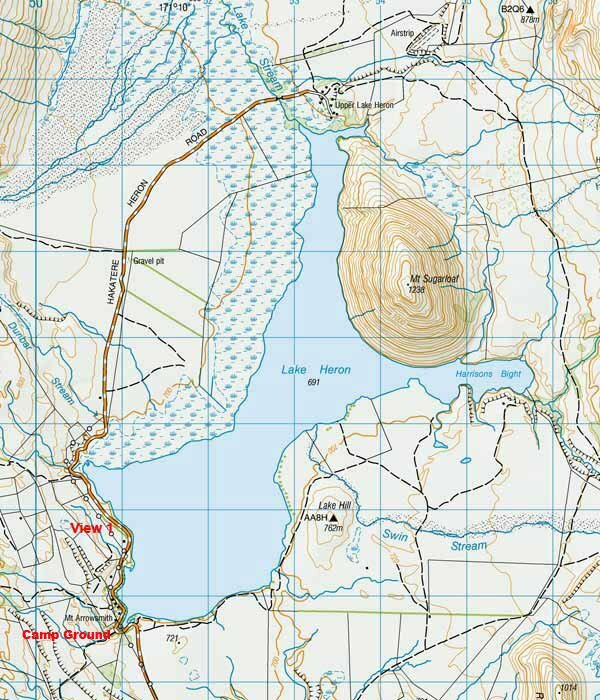 Lake Heron Map (scroll down). Spin fishing around the shoreline of Lake Heron. In the background Mt Sugarloaf is shrouded by low cloud. Lake Heron is the largest of the Ashburton lakes covering 6.3 square km. The distance around the shoreline is 19 km. The average depth is about 35m. The lake was named by early pioneer T.H. Potts after the white herons that he found on the lake. The Maori name is Oturoto. It is shaped like a letter Y and sits in a valley between the Taylor Range and Wild Man’s Brother Range. Mellish Stream and the Swin River flow into Lake Heron. While the outlet is Lake Stream at the northern end, which is a tributary of the Rakaia River. There is good fishing access along the lower part of the western shoreline from the road. 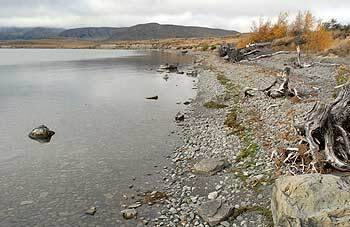 A four-wheel-drive is very useful for reaching the shoreline around the southern end of the lake. This view of the shoreline at the southern end of Lake Heron is more typical. Much of the water close to shore is shallow, obliging the angler to wade out some distance. The southern shoreline of Lake Heron now lies within the boundaries of the new Hakatere Conservation Park which is administered by the Department of Conservation. Hakatere Conservation Park protects nearly 60,000 hectares of land in Ashburton Lakes District, mid-Canterbury, South Island. The spectrum of recreation activities possible in Hakatere Conservation Park is covered in this brochure. A map of the area helps identify where activities can take place. Lake Heron holds brown trout, rainbow trout, and quinnat salmon that move into the lake from the Rakaia River to spawn in the Mellish Stream. The lake also contains small landlocked quinnat salmon which are offspring of sea-run fish that for some reason take up residence in the lake instead of going to sea. These small salmon not much over a pound or so make up the majority of the catch. There are some excellent fat rainbow trout in the lake as well as browns which as usual are harder to catch. At the southern end of the lake near the camping, ground trees overhang the water to provide plenty of cover for trout. Fishing Regulations As with the other Ashburton lakes, the fishing season opens on the first Saturday in November to April 30. There is no winter extension for Lake Heron. Fly, spinning, and bait fishing is all permitted at Lake Heron. The minimum length for salmon killed in waters of the Central South Island Region shall be 300mm except in Lake Heron where the minimum length shall be 250mm and for the period 1 March to 30 April the maximum length shall be 450mm. The bag limit in Lake Heron and its tributaries is 6 trout or salmon in total, and no more than 4 to be trout or 6 to be salmon. Motorboats are not permitted on Lake Heron but trolling or casting from rowed craft is permitted. Fish & Game Sports Fishing Regulations for the South Island pdf brochure. Kayak fishing popular but beware of strong winds One must be very careful of the strong nor’west wind which can make the lake very rough very quickly. If taking a dinghy, be prepared not to use it if conditions are marginal. In recent years fishing from kayaks has gained in popularity. Although you could walk around Lake Heron in a day, that would be 19 km or so and would take you all day. A dinghy or kayak permits fairly easy access to water that could otherwise not easily be reached. The water clarity in Lake Heron is staggering. In the picture above the water is about a foot deep. There isn’t much weed growth in the shallows. For trolling behind a rowed dinghy, or kayak, I recommend you try a bibbed minnow such as a Rapala Shad Rap SR5 or Fingerling Hi-Catch. These sort of lures are very effective as they dive down a couple of metres. The water is very clear in Lake Heron making the use of smaller spinning and trolling lures more successful. The most efficient fishing method, given the water clarity, is certainly harling a smallish fly such as an olive Woolly Buggar or small Rabbit Lure in size 4 to 6, from a kayak. New Zealand Fishing Flies. Though you often see the swirls of big trout taking insects off the surface, the fish are difficult to spot fly-fishing from the low shoreline or when wading. This can be a bit frustrating and leaves you mostly blind casting. View of Lake Heron looking across towards the towering Mt Sugarloaf 1,236m from position marked View 1 on the Hakatere Heron Road shown on the map below. With the wind blowing trout are generally difficult to spot when sight fishing with the fly rod. Therefore most of the trout and landlocked salmon fishing in Lake Heron is done by spinning. Most anglers spool their spinning reels with 6 lb monofilament line. This line weight makes for good casting distance and the ability to cover plenty of water while blind fishing. For spinners try a black and gold Toby or Glimmy. Other good spinning lures include green or brown Tassie Devils or the No.10 Super Kobra. There is a very good sheltered camping ground right at the southern end of the Lake Heron. There is no power but there are toilets. Camping fees are very low. This campground is popular during holiday periods. The period 1 March to 30 April is when sea-run salmon will be present in Lake Heron having returned up through the Rakaia River and Lake Stream, then across Lake Heron, to spawn and die in Mellish Stream. Lake Heron is a truly wonderful part of New Zealand. 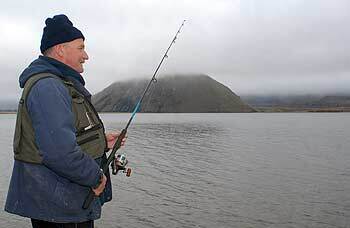 You really need to allow at least two or three days to fish it properly as well as have a good look around. Avoid being in too much of a rush. This is wilderness camping. Everything you need for fishing and camping you must take in with you. The nearest service station where you can buy petrol is at Methven. There is a pub and a Holiday Park at Mt Somers 40 km from Lake Heron. The Lake Somers Holiday Park has a camp store selling a limited range of items. They have very good cabins and powered sites for campervans. Lake Heron Camp Ground information. Extensive Department of Conservation Hakatere Conservation Park pdf brochure. Arrowsmith Lodge at Lake Heron. Mt Arrowsmith Station is a genuine working high country station and can provide a variety of accommodation options to suit all group sizes and budgets.